Ok - wait - so maybe there's still more context needed: because while I was arguing that the thing that makes good books, films, operas, TV, comics, music, etc is a determination to push the limits of what these things can do and what they can say I also was trying to make the point that this continual striving and reaching out for - well (what?) - different forms of expression say is bound up with our own social evolution. That is to say: that if someone says that they are a film fan but only restrict themselves to films made in the first half of the 20th Century then (I would put forward) that maybe they haven't really understood what it is that movies are really supposed to do . Say what? (I can hear you say) When then please tell us exactly what movies (and art or whatever ) are supposed to do. Well - they're supposed to interpret the world around us and reflect it back to us and show us - see - this is how things work, this is how they are and this is how they feel (and all sorts of stuff like that): you know there's somekind of cliché about how art (or whatever) is a form of communication between the person who makes it and the person who sees it: well - I guess that's at the centre of (whatever it is) I'm trying to say (what is it that I'm trying to say?). Well - I guess it's this: even tho you can watch old films and read old books and see old operas (and etc) and there is still lots and lots of value and entertainment that you can get from them (me? Yeah. I love a classic movie now and again) - I would argue that you're going to able to get a lot more from speaking to someone who's alive at the same time on the planet as you are than you would if you speaking to someone 100 years ago and - ok - yeah - it sure can be (or would be or whatever) interesting to speak to someone from all the way back before they had comic book blogs - but - well (my point! finally!) they're not going to be able to tell you much about what it means to be alive now at this point in human history or (if you wanna be much more blunt about it): Jane Austen can't tell you what it's like to be human (right? Do I sound less like a fascist now?). But - alright - now that's all out of the way - (I don't really know why I had to say all of that stuff - but it seemed relevant somehow - and I guess he shows you why I'm not really a fan of Jane Austen). Because - well - yeah - I've never even ever read any Jane Austen. And (as far as my conscious brain can recall anyway) I've never even seen any TV or film adaptation (not even the one with Keira Knightly) and I haven't even bothered to try reading that Pride and Prejudice and Zombies book  that came out a few years ago (and hey like I've said elsewhere on here (mainly while talking about The Walking Dead) I frigging love zombies). (and it should give you some idea of where my head is at that in what is supposed to be an appraisal  of this Pride and Prejudice comic book and I'm talking about zombies). But no. I guess what I should have realized before I started is that Jane Austen is one of the very few select authors that people nowadays (apart from all those poor kids who have to read it because their schools say so ) still decide to read for fun. 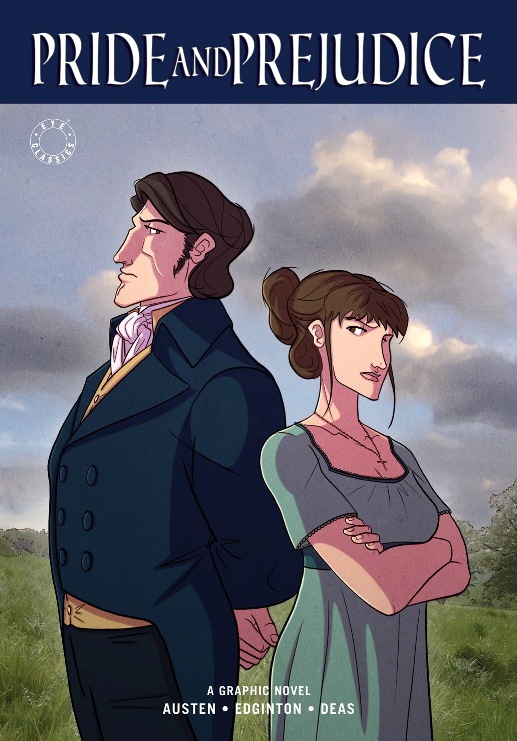 And that's because - well: her books (well - to be clear - the sense of her books that I got from reading this comic book adaption -so (you know) I'm not exactly an Austen scholar or anything like that) are pretty damn entertaining. I always thought that it was a little queer how there was so much Austen always appearing on the screen - but everyone is so damn talky all the time that it makes sense that you'd want to get some actors in and have them perform some of that rapid scatter-shot dialogue for real . I mean - even tho I kinda pride myself on having a pretty voluptuous vocabulary - there were a few sentences here and there that I had to read over a few times before I could work exactly what was being said (best example: ""There is a meanness to all the arts which ladies sometimes condescend to employ for the purpose of captivation. Whatever bears affinity to cunning is despicable."). A few other random thoughts: on the back cover they make a big deal of Pride and Prejudice being one of the most romantic stories ever told (or something: I didn't write it down and I don't have the book to hand) and I must admit that my heart strings were gently tugged: but the idea that it's the romantic story ever - I mean - wouldn't the story with the most romance also be pretty boring as an actual - well - story? Person A meets Person B - they both realise how suited they are for each other - and fall in love and move into together: I mean - that's the most romantic story ever. The main type of romantic story that we tend to tell in our culture (pretty much all of which - no duh - kinda owe a lot to Pride and Prejudice) mainly revolve around Person A meeting Person B and having them both fail to realise how suited they are for each other: which to this cynic doesn't really seem all that romantic (or better) it just makes them seem a little bit slow on the uptake . As a comic book - it all works pretty well tho. It kept doing this thing where for all the exterior shots they used this computer generated stuff that makes things look a little bit - well - cheap I guess (although - the reflections in the window on that carriage are pretty nice and it more than makes up for it by the way it uses background colour when the sparks start flying between Mr Darcy and Elizabeth Bennet (pink at one point - white at another). Plus (I realise that this is probably just me): but Mr. Bennet really really reminded me of the way that fathers tend to be depicted in manga and anime - inscrutable and unruffable and always standing around with a sly smile spread across his face. Anyone else have the same feeling? No? Just me then. And - well - yeah: in conclusion: I've gladly admit - judging from this comic at least - that Jane Austen does indeed write very well and it pretty handle with the 19th Century version of zingers ("The more I see of the world, the more am I dissatisfied with it") and snappy replies ("Do not consider me now as an elegant female intending to plague you, but as a rational creature speaking the truth from her heart.") - do I wish that I had read the actual proper book? No way - I think that would have been a commitment that would have been a little beyond my powers - but hey: praise the lord for comic books - right? I thought about maybe fudging this and making it into something that sounded a little bit less harsh and a little bit less crazy - but - hey - you should own the things you say - right? (And also my girlfriend or literary flatmate might read this and want to correct me in some sort of embarrassing way...). I can't actually remember how this conversation started - but it would make sense that maybe it was down to Sight and Sound's The Top 50 Greatest Films of All Time thing. Art? I don't really know what it is - but there has always been something that seriously bugs me about the word "art" - maybe one day I might try putting it into words on here somewhere - but for the time being I guess it's the only real description that fits - but please know that I use it only under (my own) duress. Which is a total pain in the bum to shelve at the library - seeing how it says it's written by Jane Austen and Seth Grahame-Smith: so - argh! - does it go in the As or the Gs? Also: I wonder if Seth Grahame-Smith ever chanced upon Merchant Ivory Production of Terminator 3? Seems as good a word as any. Calling these posts "reviews" has never really struck me as quite right especially seeing how a lot of the time I use the books to talk about other stuff and then at the end just kinda flump things with a little: "yeah - it's a good story and the artwork is very [adjective]." But - hey - whatever. And if any of you guys are reading this - well - my heart goes out to you yeah? In fact - after watching Requiem for a Dream I made the obvious crack on the internet about how it's the best anti-drug commercial ever made - to which regular commenter Tam responded (hi Tam!) - that actually it's more a warning about how stupid people shouldn't take drugs. And connecting those dots I guess my point is that - well - stupid people are really good for building drama around especially seeing as most of the time drama consists in people making all sorts of bad and wrong decisions - and if people are going to constantly level-headed and only doing things which are in their best interests - well - that would be boring. Further reading: Sherlock Holmes: The Hound of the Baskervilles / A Study in Scarlet / The Sign of the Four / The Valley of Fear, Don Quixote, H.G. Wells' The War of the Worlds, Rudyard Kipling's Jungle Book Stories, Gemma Bovery.